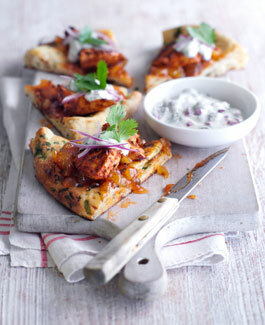 Forget making a pizza base, our delicious naan pizza is easy to make and low calorie. This fusion dish is ready to sample in 35 minutes. 1. Add two squirts of Fry Light to a non-stick frying pan and cook the chicken pieces off until golden. Remove and set aside. Toss the onion in the pan and gently cook until soft, about 8-10 mins. 2. Add the balsamic vinegar to the pan and turn up the heat. Cook, stirring often, until caramelised. 3. Heat grill to high, put the naan breads on a baking sheet and divide the cooked onion and mango chutney between the two. Scatter over the chicken and grill for 3-4 mins until hot . 4. Cut into four slices and serve with a sprig of coriander. Try adding a small bowl of tzatziki for dipping if you fancy!